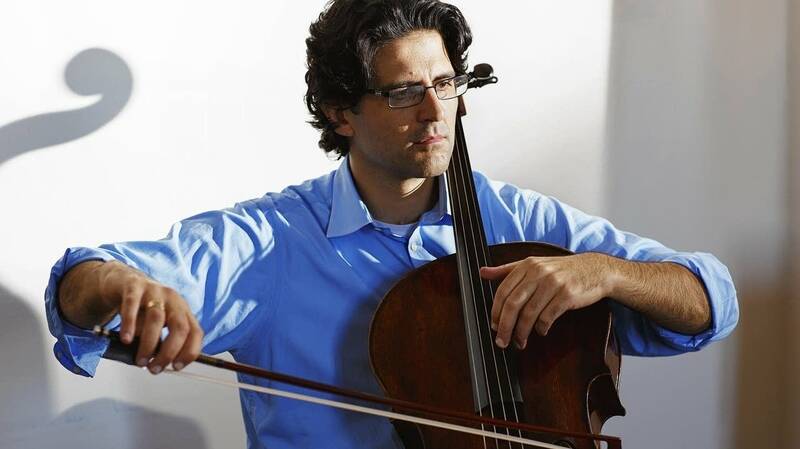 The life of Israeli cellist Amit Peled is one you might only see in the movies. He grew up in an Israeli kibbutz, a social community of about 500 people in the middle of nowhere. That's where he first picked up the cello to impress a girl in his class. Things didn't work out with the girl, but the cello is another story. "My parents were not musicians. They wanted to encourage me, so around Hanukkah, which is Christmastime, they bought a tape cassette for me. This was the 80s, and the tape cassette had music for cello and piano played by Pablo Casals. I used to listen to it every single night and fall asleep to it. I fell in love with the cello through that tape cassette, and now, 30 years later, I have this cello that I heard on that tape cassette, so there's sort of a circle closing." To Brahms, with Love is a new recording featuring Amit Peled with pianist Noreen Polera. This recording is filled with dreams come true for Amit, who traveled to the United States to study at Yale University. Then, he went on to study with Bernard Greenhouse, who had once studied with Casals. "I called Mr. Greenhouse, and I said 'Look, I want to come and study with you.' And he was willing to accept me to study with him, to live with him on the Cape, same way as he did with Casals many, many years before. And I lived there for three years, and I just observed everything about him. Of course, how to play the cello, how to listen to music, how to appreciate a good martini, how to sail in a boat. Everything about him as an artist, as a human being. It was an amazing time of really becoming a musician myself." Just a few years ago, Amit drove to Washington D.C. from Baltimore, where he teaches at the Peabody Institute. That's when he met Mrs. Casals-Istomin, the former wife of Pablo Casals. "And meeting her was basically playing for her in her apartment, because a mutual friend from Washington introduced us. And since I'm in the area, I just went into my car and drove to her apartment and played for her. And after what started as sort of an audition, and ended being a lesson, we sat on the couch with a glass of wine and she offered me the cello of Pablo Casals." Now that you've had your hands on this instrument for a few years, what do you find is so special about it? "It has, I think, the most human voice of all instruments. It sounds like an old grandpa telling you a lifetime story, and that's very special because some other, like a Stradivarius would be very golden sound like Pavarotti. It's beautiful. But this cello has sort of a character, sort of an earthy sound to it, that really feels like that sound has been around for a long time." Casals performed the Sonata No. 2 for Brahms himself, and then he went on to record these sonatas on this cello. When you think about all of that, how do you feel when you're playing these works? "It's a great feeling because there is a connection, a living connection to Brahms. There's a very beautiful story that Greenhouse used to tell me that in the sonata, where it says poco forte, which means a bit forte, he played it, and then Casals stopped him and told him, 'No, no, no, that's too loud, Bernie.' And Mr. Greenhouse said, 'Maestro, I'm sorry to say, but it says poco forte. How do you know that it's supposed to be so soft?' And Casals looked at him and said, 'Well, Brahms told me.'" Amit Peled, finding his own voice on the cello of Pablo Casals. You can hear more about this recording, the children's book Amit wrote about his cello called, 'Pablo,' and how he chose the cello over basketball by downloading the extended podcast.